IHG® Rewards Club - Musica - K. Ketler,Ken Ketler - Braxton Loves Iron Man, His Family, And Honolulu, Hawaii. Braxton Loves Iron Man, His Family, And Honolulu, Hawaii. 1. 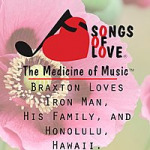 Braxton Loves Iron Man, His Family, And Honolulu, Hawaii.